The Controlled Weapons Department was created in 1946, within the Royal Aircraft Establishment (RAE) of Farnborough. The Rocket Propulsion Establishment (RPE) was created in Westcoot at the same time. These two organizations were going to initiate the development of all the British activity with regard to rocket propulsion and guidance. As part of the studies undertaken at the RAE in early 1950s, a series of experimental vehicles were studied, among which the CTV5 Series 3 able to send a 45 kg payload to more than 150 km of altitude. The Gassiot Committee of the Royal Society had defined, since 1941-43, a program of upper atmosphere research. In May 1953, the committee accepted a Ministry of Equipment proposal for using the available rockets with a view to doing atmospheric surveys. In 1955, after a thorough study of the scientists needs and existing rockets, it appeared that the RAE was to be able to provide a rocket capable of launching 45 kg to 210 km of altitude for the International Geophysical Year of 1957. This rocket, designated Skylark from 1956 forward, was to be 7.60 m long, 44 cm in diameter and 96 cm span. The Raven engine, provided by RPE, burned its 840 kg propellant load (ammonium perchlorate, polyisobutylene binder and aluminium powder) in about thirty seconds. The first model, Raven I, who provided a 1450 kNs total impulse at sea level, was replaced in 1958 by a 1540 kNs Raven II. The relatively weak thrust (about 50 kN) made the vehicle sensitive to the wind, which required the construction of a 25 m high launching tower weighing 30 tons, swiveling (within about ten degrees) on two axes. A first series of six technological launches was carried out from the Woomera rocket range, in Australia, on and after February 1957. The first three launches having succeeded perfectly, the scientific experiments began as of the fourth launch in November 1957. After twenty-two launches in single-stage configuration, the first two-stage Skylark was launched in April 1960. The Cuckoo booster rocket used to accelerate Raven had the same diameter and raised the overall rocket height to 9.15m. It burned during approximately four seconds with a 364 kNs total impulse. This version of Skylark could launch a 150 kg payload to 200 km of altitude. The Skylark improvements continued in 1962, with the advent of Raven V (1780 kNs) loaded with a new propellant. However Raven II and VA engines were both available to meet different needs. Minor modifications led to VII and VIA versions respectively, then Raven VII loaded with Raven VI propellant became Raven VIII. In 1964, introduction of devices for payload attitude control was another kind of improvement for the Skylark rocket. The year 1964 saw the first flights carried out on behalf of the ESRO. 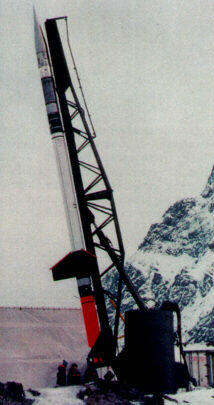 These first launches from Europe took place in Salto di Quirra (Sardinia), then in Kiruna (Sweden) in 1968. A new booster rocket, Goldfinch with a 700 kNs total impulse, appeared in February 1968. Maximum altitude with 100 kg payload grew to 380 km with a Raven VI upper stage (Skylark 6) and to 330 km with Raven VIII (Skylark 4). The fast burning Cuckoo III (407 kNs) for short-rail launches, was put into service in 1972. The ESRO sounding rockets program ended in 1972 with 82 Skylark rockets launched. However, the British national program was not the only user of Skylark because the German program had started to use this type of rockets since 1970. The gradual improvements of the sustainer led to the 2230 KNs Raven XI in the late 1974. The most recent versions of this engine comprise 990 kg of propellant and provide more than 2500 KNs in 39 seconds. Used lonely (Skylark 5) it can send a 200 kg payload to 210 km of altitude. With a Goldfinch IIA booster (Skylark 7), the apogee reached with the same payload exceeds 400 km. This version weighs 1700 kg and measures 7.94 m in length (without payload). The most powerful version is Skylark 12; it is a Skylark 7 vehicle equipped with a Cuckoo IV third stage which delivers 452 kNs in about fifteen seconds. Skylark 12 weighs 1935 kg and measures 9.25 m (without payload) and culminates at 575 km with a 200 kg payload. Its first launch occurred in November 1976. The British sounding rockets program was completed in early 1979 with a total of 266 Skylark launched. Since this date, Skylark launches are carried out by German and Swedish organizations within the framework of national programs or on behalf of the ESA. Today, only the TEXUS and MASER programs of microgravity experiments use this type of sounding rockets, whose manufacture is ended. There are still four Skylark remaining to be launched by German company DASA.